This is patently false and rather dangerous way to think about things. Inspiration, or motivation, isn’t some magical force that will come to you if you just wait. Rather, it’s something you seek out by being disciplines and driven about what you’re doing. It doesn’t matter if your goal is to write the a novel or draw paper dolls, waiting until some thing happens to make you want to do something, is pretty much a sure fire way to never do it. I’m not suggesting torturing yourself through hobbies you don’t enjoy, but I find the most inspiring thing to do is to be doing the thing already. The best ideas come when I’m already drawing, not when I’m thinking about drawing. So, Pinterest, fashion magazines, my ever growing collection of costume history books, my doddle sketchbook, these are all tools that I use to help me get ideas, but none of them involve sitting about hoping ideas will happen. Today’s Sprite paper doll clothing set is the first set in a Month. The Sprites are always a little harder than my other sets, because I have to draw a guy outfit to go with my girl outfit. Today, I was inspired by this image of a fantasy dress for the lady Sprites and this image of some armor for the gentlemen Sprites. Both images come from my fantasy armor Pinterest board. 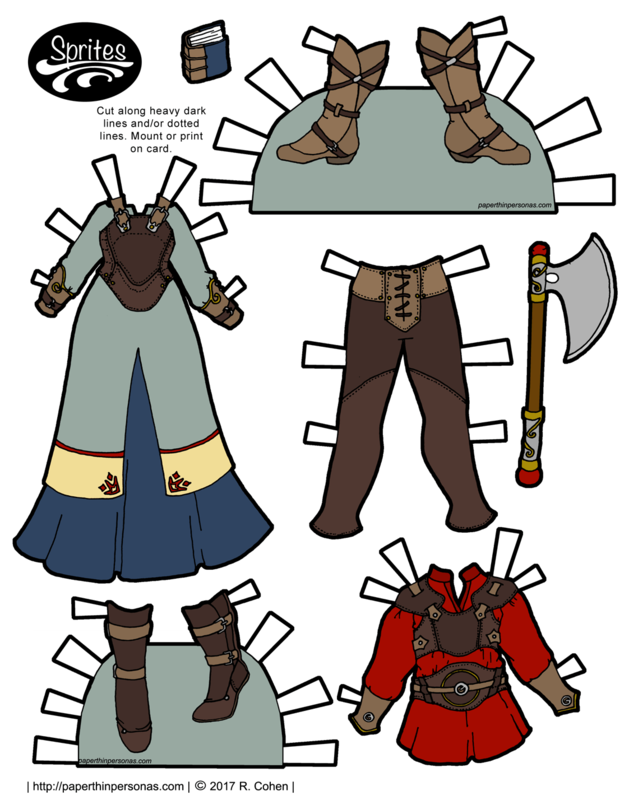 What do you think of today’s paper dolls? Do you use Pinterest? How do you find inspiration? Let me know in a comment. I really like the sprite sets for some reason. Probably should finish my thought, and not just hit post comment. I always get excited when I see you’ve put a new one up, so I am all for more Sprites. Great thoughts on inspiration! I love Pinterest, and don’t find it to be simply a time waster as I’ve heard elsewhere. I think your point about hobbies you don’t enjoy is important – I have tried many, but the one that I’ve been the most “passionate” about is card making, and Pinterest is a wonderful tool for that! Magazines are great, too, but Pinterest is new every day, and so vast. Great dolls, too, btw – thanks for sharing your hobby and discipline with us!